Abiola Adebayo, a Nollywood actress was recently involved in a ghastly car accident that could have claimed her life but for providence. 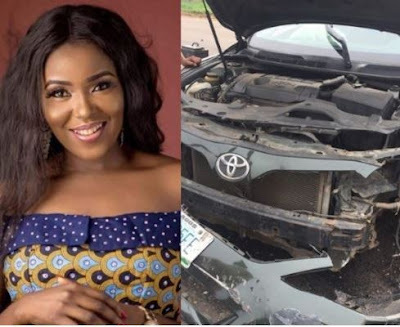 The actress who was travelling in her Toyota Camry popularly known as 'muscle' came out of the car wreck unscathed while the car was badly damaged. "I SURVIVED IT! I return all the glory to God! I’m hale and hearty and back to work. God bless you all. Just keep praying for me."